D’Art crafts various tech touchpoints for helmet brand Studds’s first CoCo store format. Helmet manufacturing brand Studds has recently brought various tech touchpoints at their new format first CoCo store in Dehradun. The 600 sq ft (approx.) 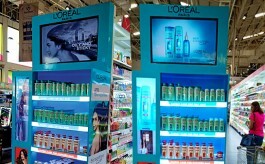 store features a few major tech touchpoints – LED Display, Virtual Reality for brand and product USP association, Interactive Display Table for consumers to understand brand positioning, virtual reality to speak about brand and product USP, digital interface that will cut down SKUs stocking Vs display etc. Studds will take this format in both CoFo and FoCo models across the country. Read the full story/research behind the design project in the May 2019 edition of VM&RD. 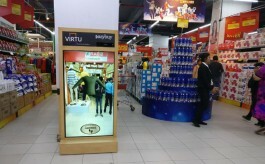 Virtu’s AR’s screen, Vivid, works as a virtual trial room and helps in brand promotion & footfall mapping. 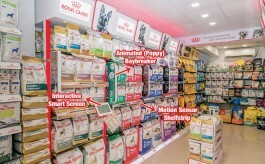 Developed and installed by Virtu AR, the device can function as store directory, signage screen and run the campaign/brand content, while also acting as a virtual trial room.